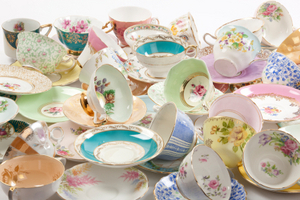 Our beautiful collection of vintage china and accessories is available to hire for your special event. We can style your vintage event to ensure that your tea party, wedding, or christening is unique and elegant. Our dainty china and country florals will create the mood for your occasion. Whatever your requirements, we would be happy to discuss and advise. Hire charges start from individual cups and saucers to full table settings with accessories.